When the members of Cong. Beth Am gathered at the Teaneck synagogue earlier this month for a Chanukah party, their cheer was dampened by the knowledge that this would be their last Chanukah celebration as a congregation. Faced with dwindling membership and income, the leaders of the almost-50-year-old Reform synagogue first announced in May that the shul would close when its building appeared in a “For sale” listing on the Teaneck shul’s listserv. The plan had been to court four area Reform synagogues and pick one to merge with. After a series of meetings and visits in the past few months, however, the congregation was divided. And so, when Beth Am closes its doors for the last time in June, its 35 member-families will go different ways, with just more than half going to Temple Sinai in Tenafly, a large number joining Temple Emeth in Teaneck, and a handful joining Cong. Adas Emuno in Leonia. Synagogue leaders are working to smooth the transition and divide Beth Am’s religious texts and other items. Burnston plans to join Temple Emeth and bring with him some of Beth Am’s programming, such as weekly visits to Teaneck’s Brightside nursing facility. Beth Am’s board members have been discussing closing for years, Burnston said. They looked for other options but found none. 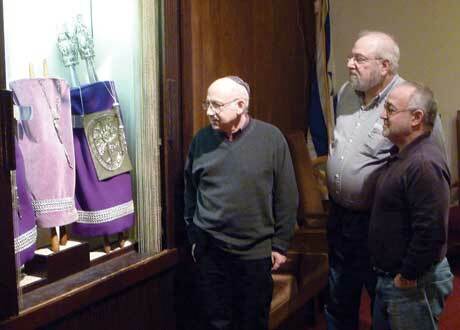 Beth Am is a second home, said Barry Dounn, the synagogue’s treasurer, who has been a member for 22 years. “We’re looking back and looking forward at the same time, celebrating our history here and looking forward to becoming members in our new homes,” he said. Beth Am was founded in Hackensack in 1964. Two years later, the congregation bought the Claremont Avenue building from Grace Lutheran Church, which was moving to River Road. At its height, the synagogue had about 140 families and was an early career stop for Rabbi Marc Gellman of TV’s God Squad. Beth Am’s confirmation and b’nai mitzvah portraits will be copied and given to Emeth and Sinai, Burnston said. The synagogue has three Torahs, one of which is a Holocaust scroll on loan from the Westminster Archive in Great Britain. Adas Emuno does not have a Holocaust scroll of its own, and Burnston has submitted paperwork for Beth Am’s scroll to be transferred there. Other items, such as the synagogue’s ner tamid and ark, are being apportioned between the synagogues. Rabbi Harvey Rosenfeld, who has been with Beth Am for 14 years, does not yet know what the future holds for him. He has a background in social work and has worked as a Hillel director as well. Members of Temple Emeth and Temple Sinai are eager to greet their new members, according to their rabbis. Sinai is not just getting a boost in membership, Millstein said. The members coming from Beth Am have proven themselves to be dedicated to synagogue life, he said.